What Are the Benefits of Sleep Training? How sleep training can help your baby sleep and prevent sleep problems from building up. Sleep training is teaching your baby to be able to fall asleep independently. Most people who do Babywise intend to do some form of sleep training, but many wonder what age to start. With my oldest, we started around 9 weeks old. With my second, Kailtyn, we started at 5 days. With my third and fourth, I started right as soon as we came home from the hospital. Many parents also wonder what sleep training methods to use. With my youngest two, we did the Four S’s for sleep training, which involved little to no crying. With my first two, I didn’t know about the Four S’s, so we did Cry It Out (CIO). Because we started so much sooner, CIO was faster for Kaitlyn than it was Brayden (started at 9 weeks). I really think babies are born knowing how to soothe themselves, then we teach them to be dependent upon us soothing them in some way. Here are my thoughts on CIO. There are so many benefits. Imagine going out of town or to visit a friend or family and you can just easily put your baby in bed for naps and nighttime. CIO is also a good step toward developing self-control, which I think is kind of the bigger picture of the BW method down the road. There is so much you are going to want to teach your child, and a person who has control over their appetites and temper and impulses is going to have an easier time getting through life. Your child will get more sleep. You will get more sleep. You will have more time to do anything from the dishes to hobbies you enjoy. Mentally and physically, it benefits the whole family. The answer to this depends on you. Start when you think your baby is ready for it. Not when you think they won’t cry at all (that day won’t come), but when you think they were ready. You will know. I sensed Brayden was ready at 3 weeks, but I wasn’t ready. This brings me to my second point. Start when you are ready. You need to be committed and ready to endure crying. It isn’t easy. But you need to let your baby CIO. If you can’t, don’t do it. Don’t start if your baby is sick, don’t start if your baby is teething, don’t start if you are moving, don’t start if you are about to travel….etc. Be aware that it won’t get easier as your baby gets older. Your baby will start to be able to wiggle around the crib, potentially getting him/herself stuck in a corner. Your baby will eventually be able to sit up and stand up. Your baby will get more stubborn. Your baby will learn to talk and yell “Mama!” Keep these things in mind when deciding what age to start. Also, the older they get the louder their cry is. That is something to consider if you have older children or close neighbors. I like starting young because there are fewer factors to consider. Older babies getting into toddlerhood start to have nightmares and have fears. And while a lot of children never CIO and can sleep just fine, I know several people who never did CIO with their children and now have 5 year olds who still have never slept through the night and end up in bed with them every night. One friend changed things with her second and did CIO and her 1 year old sleeps better than her 5 year old. My sister-in-law changed nothing and they bought a king size bed to fit their 5 year old and 2 year old in bed with them. So keep that in mind when you are deciding if CIO is for you or not. I think those cases are rare, but they do happen. Poll Results: What age did you start CIO (approximate)? What Age Did You Start CIO (Approximate)? In response to your post: I started with my baby girl at 5 weeks. I had been reading the book when I was pregnant, and loved how the parenting philosophy and strategies fit in with my own. When my daughter was born, my husband asked our lactation consultant nurse about schedules and she had terrible things to say about schedules and in particular BW. This scared my husband and myself off, since we were first time parents and wanted to make sure we did everything right. By 5 weeks I was EXHAUSTED and sick of the unpredictability. I would rock her to sleep and lay her in her crib thinking “okay I can FINALLY sleep now, and she will PROBABLY sleep for 2 hours”…20 min later as I was just nicely dozing she was waking up! A friend at church that week suggested BW, and they are the parents of 5 amazing kids and then I remembered all the other amazing parents and kids we knew who had used BW and I picked it up again, and from that day on, my baby started crying it out. By 5 weeks, she was very used to me rocking her to sleep and being held as she fell asleep, so she would cry for up to 45 minutes sometimes, but by week 2 that had shortened to 30 minutes, and each successive week it was shorter still. She now no longer cries, or if she does it is only a bit of a whine for 5 minutes. Even though the nurse had “scared” us off of it at first, it was almost kind of a blessing in disguise. My baby had problems nursing (which we didn’t know about) and she was feeding for up to an hour and a half and still screaming. I assumed she was colicky, but by 2 weeks I had had enough and saw a lactation consultant. We figured out our nursing problem and started supplementing her with formula. Suddenly we had a happy baby on our hands! I think if I had tried to do BW at this time, not knowing what was going on I would have been very frustrated (I already was)…so definitely if you have feeding problems it is NOT the time to start crying it out. You want to make sure you have all that other stuff under control first. Anyways, I love BW and have no regrets about using it! Thanks again for your awesome blog! Thanks Kindra! Thanks for sharing your experience. I am glad you found us. i have a question. my daughter is 8 weeks old. she only naps in her swing (moving) and sleeps through the night in her swing (unmoving). she hates the crib, seems like she hates being flat on her back. my doctor seems to think it is too early to start letting her CIO. any advice? Thanks Valerie. Any ideas on how to CIO at night if necessary? To CIO at night, you just do it. I haven’t ever done CIO in the middle of the night, and I wouldn’t recommend it until baby is sleeping well in the day. Your nerves will be shot if you try it all at once. I always just fed my kids when they woke in the middle of the night. Then they slept through and all was fine. Some do need CIO in the night, though. I would just wait until day is getting better before you move on to the night. Hi Valerie, I’m glad to hear you had a similar experience! Usually when he hits the crib and jostles, then eventually starts crying, I just feed him again until he is so asleep that he doesn’t wake up again when he hits the crib. But I don’t want nursing to become a sleep prop for him in the middle of the night when he wakes up and can’t fall back asleep right away. I want to be able to put him right down after I know he’s gotten a full feed and walk away, knowing he can get himself back to sleep if he has been woken up a little bit by the transfer. Anyway, my husband and I really need some more sleep, though, so I think your idea is a good one- we’re still trying to get his days down so his nights have been so messed up anyway. He’s been up every 3 hours just like it’s daytime. Last night we just put him straight in the swing after the feeding, he jostled there too but he went right to sleep the first two feedings, the third he cried very loudly for like 20 minutes, was quiet for about 15, then cried again or about 5 before finally falling asleep- to wake up 1 hr. 25 min. later. Also I am definitely doing my best to make sure he gets a full feeding- and I should mention that he’s 6 weeks today, is the potential growth spurt just a double whammy with the fact that his days have been so wacky lately?Any thoughts on a good strategy for us? Yes, six weeks is a very difficult time, especially for breastfeeding moms. Your prolactin levels drop, which help make breastmilk. You definitely want to make sure you nurse as often as he needs to ensure the needs of the growth spurt are met and you maintain a good milk supply. Remember, you always feed baby when he is hungry. Then you try to figure out why he is hungry early. If it is a growth spurt, you just feed away until he is out of it. If it is something else, you try to solve problems that way. Have a CIO question: when you decide to start letting the baby CIO, do you do it every single time you put them down, both day naps and night sleeps? I assume consistency is important. Also related — we will be traveling in about 10 days.. I want to start now but would you recommend we wait? The good news is that he will be sleeping in the same pack and play no matter where we are. Thank you for all your advice. You already have been very helpful! Nicole, Yes, every time. Consistency is the main ingredient for success.Tricky timing. By now you are a week away. It is long enough to get started and possibly have success. If you won’t continue CIO there, I think I would just wait. If you start it, stop it, then start it again, it might be too confusing for him. This is one reason I don’t do CIO at night. We (as parents) always end up getting desperate for sleep and interfere, which only hinders CIO progress. 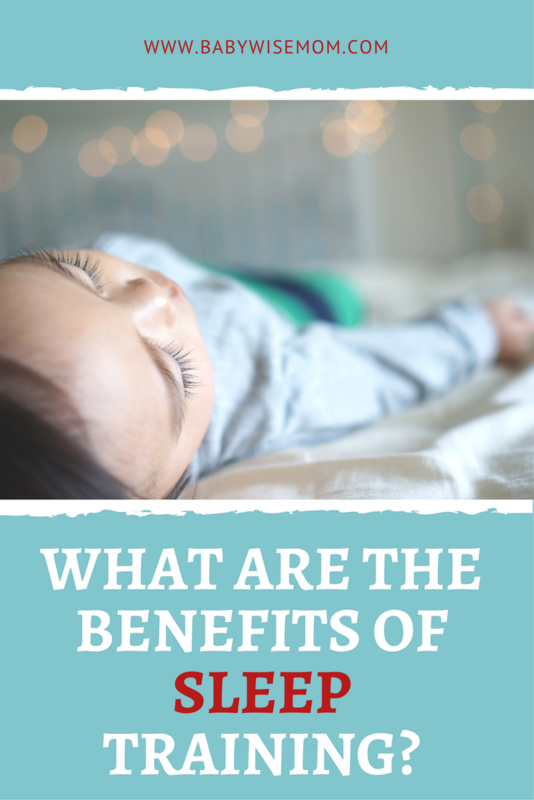 For some it works out great, but I would only do it if you know for sure there is no reason for the waking.It could be a growth spurt, it could be teething…see this post for more ideas: 5-8 Month Sleep Disruptions It is best to find the reason for it and treat that. This post will give you guidance. I have a 12, almost 13 week old baby boy who is still not sleeping through the night. He sleeps well during the day and on his own. We haven’t had to have any CIO times beyond on occasional 10 minutes. He really sleeps easily on his own, which is very different from his sister who had to CIO hard for a couple weeks, but slept through the night at 6 weeks old. I am not sure what to do about it for several reasons. The biggest of my reasons is that we will be moving sometime in the next 4 weeks to another house. Even though I feel ready to let him CIO and if feel he is ready too, I don’t know when it is appropriate to do it around a move. Also right now, he is sharing a room with his older sister who just turned two. I can let him fuss for 10 minutes or so, which I have done, and she isn’t bothered by it. Anyways we only have 2 bedrooms right now, so there is no other room for him to sleep in and I don’t want to put my daughter through a whole night of crying. Overall, the sharing a room thing is working out really well and I would like to continue it when we move, and use the pack and play in our large closet for him to sleep in while he has to CIO once we move. When would it be OK for me to start CIO with him. Should I wait potentially another month until we move before we CIO , and if so what is the best way to deal with the night wakings now without creating deeper habits. I have tried not feeding him when he wakes at first, to see if he is really hungry, and it usually works to just give him a pacifier to go back to sleep, and if he wakes again I usually feed him. However since I have started doing this, he is begining to wake up more frequently andI believe it is b/c he is wanting me to give him a pacifier everytime he wakes instead of going back to sleep himself. When he does feed at night it isn’t for long and when he wakes in the morning he isn’t very hungry. He actually wakes up more now than he did when he was younger. Overall, he is a good sleeper during the day and has always gone with a schedule very naturally. I am just not sure what to do. Erin, If it were me, I would wait. With the move and the time change coming up, I think it would just be better to wait. However, if you really feel like he is ready, see if you can send your girl somewhere (grandmas?) to sleep over and try it. The difficulty would be if he is one that needs a few weeks of CIO rather than one night. But you could try it. Remember boys do statistically sleep through later than others. Good luck! Hi Val, I was just wondering…I have been letting my 3 week old son CIO for 5days now and it has been rough! Often times he cries for an hour and still doesn’t fall asleep so I end up putting him in his swing for the rest of his nap time. I know that I read that after 8 weeks you said Kaitlyn rarely cried at all…will it be this rough for 8 weeks? Or, does it progressively get better?? I just don’t think I can endure 1 hour crying sessions at every nap and bedtime for 8 weeks! Please help! Hello! I just wanted to post a follow up to my previous post regarding CIO.I let my son (3 weeks old) CIO for 7 straight days for every nap and bedtime. I noticed some improvement but not anything to brag about. He is a very persistent little boy! (BTW-CIO worked in just 3 days with my daughter…so, if this is the way you want to go, please don’t let my post discourage you. Also, I think timing is very important. I didn’t do CIO with her until she was 3 months…so, timing may have been the problem here too) As I have to go back to work in Feb, I had to find another way to sleep train him. So, I picked up “Secrets of the Baby Whisperer” and found that her sleep training technique worked better for me and my son. After three days, I can put him down with little to no fuss. I am an advocate for CIO in some situations and you have to do what is right for you and your family. In my case, I didn’t want to let my son CIO during the entire time I was off for maternity leave. I know that I may have to put in a little bit of extra work later, but I am willing to accept that as I have a very happy and well rested little boy on my hands now! mshave, It gets better, but it isn’t necessarily a progressive step-by-step better. It is more like a two steps forward, one step back. But as time goes on, the steps back happen less frequently. I am glad that the Baby Whisperer has worked for you. It is perfectly acceptable; you are still teaching him to self-soothe. My baby is 10 weeks old and we have only been doing BW for 1 week… it has worked miracles. My question is… I feel like 6 feedings during the day is more natural. I feel like I’m cramming the feedings in at the end of the day. If she is still not STTN, can I eliminate a feeding and stretch her to 3-3.5 hours. She wakes every night around 3:30/4, eats and goes right back to sleep. Please advise… do I need to do 7 feedings plus the middle of the night feeding totally 8? Kris, age-wise, that is fine. Just know that dropping day feedings in the day before night feedings are eliminated usually means night feedings will last longer. However, some moms find that doing what they feel they should in the day actually helps improve nighttime sleep. Hello there -Strange…I left this comment yesterday but it is not showing up anywhere. Apologies if you get this twice!We have been doing CIO with my baby girl for 7 weeks now (She is 8 weeks today). She has been getting better and goes down for most naps with no or little crying (knock on wood – I hope I don’t jinx myself!) However, she is consistently having a difficult time with her last nap of the day (after her 6:00 pm feed). She falls asleep after crying but wakes up (after 30-45 mins) and is just not able to put herself to sleep. When it is half an hour befoer her next feed, we just get her and try to rock her to sleep. I noted that she used to fall asleep in the chair either after a long time (20-25 mins of rocking or not at all). Last two nights, I noticed that she is actually quite awake and happy. She looks at the ceiling fan and talks to it 🙂 Is it that she is getting too much sleep from her prior 3 naps (almost 2 hours each since I had to cut back the wake time to get her to nap better)? Is she ready to drop this nap? She is only 8 weeks old and is on a strict 3 hour schedule because I had a difficult time earlier in getting her to sleep through her naps when we were doing CIO.Or should I jsut stick with the CIO and she will get through this nap as well? It is tough to stick with it after hearing her cry for 7 weeks!Thanks! Hello there:Not sure if I am doing this right and you are getting my questions. In the past, you have been so good about responding so quickly that I think that perhaps I am doing something wrong. Is there an email address perhaps that I can write to? Mine is [email protected] DESPARATELY NEED HELP. We have been doing sleep training for EIGHT WEEKS now (we started in when my girl was a week old). We have two humps that we cannot seem to get over:1. Evening naps – last two naps fo the day (3:00 feed and 6:00 feed). SHE WILL JUT NOT GO DOWN. She will whimper and cry and just cannot put herself to sleep. 2. Waking up out of a nap – she will wake up out of her naps as well. Sometimes, she’ll cry for 10-15 mins and put herself back to sleep. Most of the times she won’t.After 8 weeks of doing this, I really need hope to go on. It is getting better, but no where near what I had thought. Is there a problem that she cannot put herself back to sleep? Should I stick with CIO for some time? Or just give up?In your blog, you’ve indicated that putting themselves back to sleep is tougher form of self-soothing than putting themselves to sleep. But when will she get it?Also – she does not take a pacifier. Perhaps this will help soothe her? I am not sure how to give it to her. In the past, when I’ve tried, she has spit it out. And it has not worked.PLEASE HELP! Manisha,The time of day after the 6 PM feed is 100% a normal time of day for her to have a difficult time. a 30-45 minute nap is also 100% normal. She isn’t ready to drop it, she just doesn’t need it to be longer than it is, and that is just fine. If she is breastfed, I would actually recommend you feed her when she wakes. Both of my kids needed to be fed earlier at this time of day than the rest of the day. Most moms have lower milk supply in the late afternoon (and/or lower quality of milk–meaning fewer calories), so baby needs to eat sooner. We even had times where this interval was only 2 hours.For the waking early in naps, see this post for options on what to do:Waking Early From Naps/Won’t Fall Asleep For Naps: http://babywisemom.blogspot.com/2008/01/waking-early-from-napswont-fall-asleep.htmlWhen she will get it is just dependent on her. Think back to when it started. Did it start around 6 weeks? If so and you did not feed her as soon as she woke, she might still be trying to fulfill a growth spurt need. See the blog label “growth spurts” for much more on this.As far as time to respond to questions, it typically takes me about 5 days (you can see this in the Welcome message on the side of each page). There are a lot of questions that get asked each day and it takes me some time to get through them. I just left a question but forget to add a few things. I hope I have posted my questions correctly and that you are able to receive them. We have been trying this new schedule for 3 days. The napping seems to be a bit better but the feeding is now a problem. My other concern is that when i put her down for a nap she usually cries for 5-10 mins and then settles but will only sleep for 20-40mins at the most and I have been leaving her in her crib until the next scheduled feeding. During this time she is either just lying there awake or she will be crying. I don’t know what to do. In the past I have tried putting her in the swing but she doesn’t seem to like it and it is also very loud with my son playing. I really need your advice. My 3 m/o has been CIO for 11 days. We started late due to reflux that is now well controlled. We are about to have a very hectic family schedule over the next 3 weeks. Should I suspend CIO until we are back on track? Or should I still keep trying when we are home? The biggest problem with “putting” him to sleep is that he doesn’t sleep long enough. Plus the night waking.Once we are settled again in 3 weeks, should I just start CIO from day 1? It was suggested to me to ease him into it. I don’t really know what that would mean. I’m more of an all or nothing kind of mom when it comes to this. Thank you for your help! This is my 4th baby, I am so thankful for all the information and help your blog provides! I wish I’d had this with my other 3! Would have saved a lot of mommy tears! Thank you for your response. I have changed her schedule to a 31/2-4 hr schedule starting at 7:30feed(9-11nap), 11feed (1-3nap)3feed (4:30-5:30nap) 6:30feed 7:00 bed 10:00-10:30 dreamfeed. We have been on this schedule for about 2 weeks and have also been CIO for 2 weeks. Her morning nap has been great. She goes down pretty good, will cry for about 5minutes and sleeps until 11:00 and I usually wake her up. Should I let her sleep longer and have her wake on her own? If I do this when would I feed her? Her afternoon nap isn’t great. she goes down with some crying 5-10 minutes and will sleep until 2. She wakes crying. I would like her to put herself back to sleep but she is not able to do it. She will cry on and off until I get her at 3:00. I find this nap very difficult because my 2 year old son is sleeping in the room beside. Should I keep her up longer maybe 1:30? She then naps at 4:30 she shows signs of drowsiness at this time but has a difficult time going down for this nap. Sometimes she will sleep 30minutes and other times she won’t sleep at all, she will just cry and fuss until I get her at 5:30. we have been feeding her at 6:30-6:45pm and then putting her to bed at 7pm. She is not yet STTN she is waking anywhere from4:30am-5:30am and for the past 2 weeks I have been leaving her until 7:30am. Should I get her sooner? I don’t think she needs a feeding at this time because when I did feed her, she wouldn’t feed at 7:30am. I am also wondering about dropping her dreamfeed but don’t know if I should until she is STTN?? Any advice or suggestions would be greatly appreciated. hello,can you please paint me a detailed picture of what cio actually looks like? i keep reading vague experiences, but i want to know what it actually looks like.for example, if i put my daughter down for bedtime at 7pm (she is 4 weeks old), and she sleeps for a bit, then starts crying…does cio mean i let her cry for 15 minutes, check her, and she is fine, then leave her to cio until the next feeding? or am i to check her at 15 minutes, check her again 20 minutes later, then again 20 minutes later?i guess i want to know specifics of what people are actually doing–what does cio look like?thanks. hopeful, you should check out the CIO Bootcamp on this blog: http://babywisemom.blogspot.com/2007/11/cio-bootcamp.htmlIt is the best resource I have read on any website or in any book on how to realistically approach CIO. Good luck! Stephanie, Sorry this is a late responses to your question that about the next three weeks. At this point, if you stopped CIO during this time, you want to just start it. I don’t really know how you would ease into CIO either. It seems that would have to involve inconsistency which wouldn’t do him any favors. Let me know if you have more questions! Heather,You want to wake baby if needed to stay on schedule. Since you are on a 3.5-4 hour schedule, you can to to 11:30 for that first interval if needed. That puts you at 4 hours.It takes time for babies to learn to put themselves back to sleep mid nap. So since you had been doing CIO for 2 weeks, I would give it more time before expecting her to settle back in mid-nap. An idea for you is to put her in a bassinet or pack-n-play in your room (or a room away from DS’s room) so you don’t have to worry about his nap being ruined. It is possible she would settle after a couple of minutes, but you likely don’t let her go that long with DS next door sleeping (I don’t think I would either 🙂 ). It is totally normal for the last nap of the day to be short like that, and also for baby to be fussy before hand. Watch the stimulation she gets before it. Since her nap before that one isn’t great, she might need to go down earlier for it.Don’t drop dreamfeed before STTN unless you really feel like she would sleep better without it–some babies do.I would stick with the dreamfeed and see if she will take it, but if not, you might as well stop doing it and see what happens. But know that since her last feeding of the day is at 6:30, she likely won’t be able to make it much past that in the morning, so her waketime would be 6:30-7:00 ish. Hello. I’ve been searching on your website and have found bits and pieces to my questions but just need some redirection or confirmation. My son is now 7 1/2 weeks old and we’ve been doing BW from the very beginning. By 5 weeks he had dropped is 130 am feed. He would stir around 330am at which point I would put a soother in his mouth and he would sleep for another 1 to 1 1/2 hours. I then realized that I couldn’t be putting in the soother all the time so he need to settle himself. Now he is waking up at 230am quite consistently and I am trying to let him CIO. Its been 4 days and only once has he STTN until 4 am. I always check on him, make sure he’s bundled and change his diaperMy question is this:1) Will I disrupt him changing his diaper because i know regardless he is always going to have a wet/ dirty diaper in the middle of the night. Also, do I just need to stick out the CIO as many people have mentioned it can take anywhere from 3 days to 2 weeks. I’m just concerned that maybe I should be feeding him, however he went those two weeks without eating at the 130 am mark. When he wakes again at 4am he is so hungry but then sleepy for his 7 am feed. Any thoughts are appreciated!2) He also has about 2-3 naps during the day which he CIO. Some days we are out and about so he sleeps more. Would him not having the ability to CIO (as a result of a busier day/ more time in the car) be a factor in his nighttime sleep?Thanks for you time and congrats on your new bundle of joy! dear plowmanators,thank you for responding to all my inquiries. i really appreciate the time you take to answer everyone’s questions! If I'm home with my baby during the day, can I CIO even if my husband isn't committed to it on the weekend (I often find him getting baby up, especially when I've left to get groceries and find them both asleep together on the couch)? Jenna1-It is possible to disrupt by changing the diaper. I find it wakes baby up a lot. I don't know what he is doing by now, but I would personally just feed him when he first wakes and go from there. Being able to do something a few times doesn't mean it will last forever (sadly 🙂 ).2-Definitely. Disruptions to the day will always affect nighttime sleep. I would keep a log and see how it affects him and then try to avoid disruptions as much as possible. You will have them–you have to continue living–but you can figure out how to minimize them. You can see the posts under "disruptions" and "flexibility" in the blog index for more on that. Becky, This is a hard one. You can–that would be 5 days of consistency. Perhaps by then your husband would see the improvement and not interfere. But I would try to get him on board because it can really interefere with progress. Thank you so much for doing this blog! I have a 6 week old and am wondering when it is ok to start CIO? We have done it sometimes but usually after a certain amount of time say 30 mins to an hour when put down for a nap we pick her up etc..put back down. She keeps crying so we pick up and hold her until she sleeps and we just keep her with us until she is asleep or it's time to eat. I think she is going through a growth spurt, and has had two days this week where she will not take a nap! What do we do in this situation? She is super tired and overstimulated all day and after I feed her I put her down almost right away because I don't want to keep her awake too long. She doesn't sleep though anyways. Please help…Thanks. Hello, My son will be 3 months old on Friday. I've had a difficult time establishing a set routine for him since the beginning. His wake time is at 6:30. However sometimes he goes 3 hours before eating again other times it's 2 and half. Part of the problem is his naps. He struggles to nap for 45 min let alone the hour and or hour and half he's suppose to have. I have tried cutting back on his wake time but still have difficutly with this. I've just started letting him CIO when I lay him down. Up until this time I would end his wake time by reading to him in the rocking chair and he would fall asleep and I'd lay him down for his nap. Now he falls asleep and wakes up when I lay him down. Needless to say it's time for CIO. He's been crying for 20 -30 minutes before falling asleep and then he doesn't sleep long after that. By the time I feed him, have his normal wake time, let him CIO and he falls asleep, it's been 2 hours and he wakes up. Do I need to let him lay in his crib and cry until it's been 2 1/2 hours (his next feeding) or should I get him out and see if he's hungry right away? If I get him out and feed him do I lay him back down to finish his nap or just treat it as a feeding and do a wake time,etc. ? Shouldn't he be able to sleep longer than this? He's struggled with this since birth. He sleeps pretty well at night. I put him down around 8:30 or 9:00 and he usually wakes up at 5:00. Which brings me to another question. He's been getting up at 5:00 and is hungry so we feed him and put him right back down he use to sleep another 3 hours after that but the last 2 days he's gotten up then at 6:30. I feed him and he falls back asleep, I can barely keep him awake. Then he will sleep until 7:30 or 8:00 and get up and eat again for just a short time. His wake time is normally 6:30, which he is still getting up at. I don't know whats going on. I feel like everything is out of control! I started logging everything today so it would be easier to look for patterns. Is this what happens during a growth spurt? Sorry for all the random questions I'm just not sure what's going on. Blessedmom:Until recently I was having exactly the same problems you were and my baby is the same age. I finally began to link daytime nap problems to nighttime issues. I was nursing my baby to sleep at night. I wasn't doing it intentionally (so according to BW, it was okay, right?) but because of this she had no idea how to take a nap! So I actually started waking her up after her bedtime nursing and then putting her in the crib. I decided then it would be okay to let her cry it out at bedtime because it was very shortlived because she was tired and not very intense. I went through about two weeks of CIO at nap time which only led to SCREAMING until it was time to eat again. Getting her to fall asleep herself at bedtime was key. She still cries when I lay her down for a nap, but only for a short time. She still struggles with longer naps and I've related that to a nighttime problem of her waking up every morning at 5. BTW if she wakes up at EXACTLY the same time every night, she's probably not hungry. Try popping a paci in her mouth and go back to bed. Even if she spits it out and continues to cry, chances are it will be less intense and she will go back to sleep. Now I don't even have to get up. I know she's still waking up, I heard her cooing last night, but she lets me sleep! She's gradually making her naps last 45 min to an hour. Because of this at 3 months, she still takes all of her naps between feeding and waketime (though I'm trying to drop the evening nap, with some crankiness). I guess one thing us parents of catnappers have to keep in mind is that we just need to make sure that they have more naps and less waketime. My baby does tire more quickly than other babies her age, but she is waking up happy from her naps, so I can't complain too much. Makes it hard to do stuff though! Anyway, hope my trials help. It's not exactly textbook babywise, but I made it work for us! Blessed MOm- I had a similiar experience to Becky. At 5 weeks my son began to extend his 1am feed to 2-3 so we let him CIO for a couple of nights. For the first few nights I put in his soother. Then it only took about 5 days to CIO. At about 10 weeks I was finding he would wake around 430-530 be ravished, then would be hard to rouse for his 7 am feed. I took this as it was time to drop his 4 am feed. Plus he was about 13 lbs. For the first few nights I would flip him to his tummy (since I was getting him up 2 hours later anyway and he sleeps better) and/ or put his soother in. After about 2-3 nights of this I let him CIO, which only took 3 days and now he eats at 10pm and waks up on his own anywhere from 7-8 am. It sounds like your little one is ready to drop his feed, ESPECIALLY if he is sleepy at both of the following feeds. As far as naps go my husband and I realized we were overstimulating our little guy. We would play with him, read to him etc and then he started skipping naps! We soon realized he doens't need us in his face all the time 🙂 Now we play for about 15-45 minutes, depending on his mood, then let him continue to play on his own. Usually he just falls asleep and somtimes he CIO's for about 2-15 minutes. I know it sounds horrible but we actually put him on his tummy for some naps during the day and he falls alseep much quicker and harder.If my boy wakes up early from a nap (he's also 3months btw) I don't feed him unless he's hungry. Or if I do feed him I put him down after about 20 minutes of play time and then put him down to play as normal, then let him sleep the extra 1/2 hour so he's back on track. I hope this helps. Every baby is different but this is what, after much contemplation, seemed to work for us. Blessings to you! Travis, you are the only one who can judge if/when she is ready. See the thoughts in my CIO posts and see if you think she is ready. Keep waketimes lengths short enough. Even now, at 9 weeks, she can most likley only handle about 1 hour of waketime. See the blog label "optimal waketime" for more on that.If she is not napping at all all day, then she is overly tired and having a hard time falling asleep. Do what you can to get her well rested before starting CIO. Blessed Mom,This is normal in the early days of CIO. As he gets more adept and self-soothing, he will be able to take longer naps. Do keep working with waketime lenghth. He could even need a longer waketime length. Right now when he wakes early, see if you can help him fall back asleep. You can give him 5-10 minutes to see if he will settle. If not, help him out so he can remain well-rested.If he is hungry, treat it as a new cycle. Feed, play, then nap.With a growth spurt, they will eat more often for 1-5ish days (though there is no set time-table). But eating every 1.5 hours is a bit excessive I think. 2 hours is pretty normal. But with about 60 minutes of waketime plus at least a 45-60 minute nap, he should be able to go two hours.Jenna and Becky gave you some good ideas to consider, also. Thanks gals! I love this blog! I have a 2 year old which I did babywise with and now I have a 5 week old that I am trying to babywise with too. I am trying to teach him to self soothe at naptime with the COI method. I have a question though. My 2 year old takes a nap around 1:30 and my 5 week old goes down around 2:00, I don't want to interupt my 2 year olds sleep by letting my newborn COI,but I also know that I need to do this to get him to put himself to sleep. I haven't started the COI for night time yet. Any suggestions? My husband and I put our son to sleep in different rooms (for naps) that way he doesn't ever need to be in the same spot to go to sleep. We started this because we love to travel and don't want it to hinder our life. So far he sleeps great every where. If your 2 y.o is sleeping in his room then put your baby down on your bed, in the living room, etc. Somewhere that works for everyone. HOpe that helps! thanks Jenna, however, our house is setup where all of our bedrooms are on the top floor right next to each other, so he would still hear the baby. Our house isn't that big so no matter where my 5 wk old is you will still hear him. Callfam,1. it depends on who you ask. Some would say there is no way a four month old can be hungry at night. However, Brayden was hungry at night at that age, so I believe it is possible. With solids, you have to just take it as his pace. You can't (and shouldn't) force him to eat more than he will on his own.2. I give gas drops after every feeding all day. If you think that is your main problem, I would give it after every feeding and then at night (but don't exceed dosage). I think gripe water is good for immediate relief and mylicon is good for prevention.3. Since you think gas is the problem, I would not recommend CIO until you have that taken care of. If it is gas, no amount of crying is going to help him sleep through the gas pain. Does that make sense?Good luck! Cindy, I would get a sound machine or humidifier or some sort of white noise for your two year old so the sound will be muffled. Thanks Plowmanators! That is a very clever idea. I will give it a shot. Ok I am at the end of my rope with this COI. I have been doing it for about 2 weeks now and I don't see any improvement! What am I doing wrong here? I feed him, have wake time for about an hour and I watch for his tired signs, and sometimes they don't show until 1 hr 30 min. I put him down in his crib and he cries. He cries for 45 minutes, screaming really. So I go in and try and calm him but that makes it worse, so I end up getting him out and putting him in his little chair, and he goes to sleep, because I turn on the vibration. I kept a log and I don't see any patterns that could be contributing to his struggle. I can't take this much longer for every nap. My first was not this hard to train. Jenna- I normally have him in his chair and I will be doing stuff around the house so I am not interacting with him a ton, I will stop and talk to him once in awhile but not too much. I try to interact/play with him after he gets done feeding and then let him be until naptime. How long did you keep your bambino up for waketime? How do you know if you are putting them down too early or too late, cause either way he would still scream. Do you think I should be putting him down after exactly one hour of waketime everytime? TIA! CindyAs frustrating as this answer might be, experiment. I had to try different things with Ollie until I knew what he needed. Try playing for 20 minutes then put him in his crib or somewhere he can easily fall asleep. Sometimes we would put Ollie to sleep in his swing, without turning it on, that way he could see everything. That way his "alone time" would transition into nap time. He might still require more sleep or quiet time then he's getting. Hope that helps. Its so hard to know but I know you will figure it out! Yah I am starting to experiment today. I do have a question about eating schedules. I have him eating every 3.5 hours which his dreamfeed I have set aroung 10 or 10:30, the book says to get in 7-8 feedings at this stage which with a 3.5 schedule that doesn't happen, do you think I should be doing every 3? He doesn't seem hungry at 3 when I have tried so that is why I moved to 3.5. Am I doing this wrong? CindyEvery baby is different. I work in a NICU setting and it is our policy to put healthy babies on demand vs a schedule. If your baby seems content, is gaining weight, etc is a 3.5 schedule should be fine. We have a 10-week old who was on-demand until yesterday when my husband I decided that we've had enough and would like to try the BW method. I tried to let her CIO for her morning nap just now, but after 2 hours of moaning, then crying, then more intensified crying, I noticed that she began to get so worked up that she was choking on her saliva and her face turned bright red. For fear of something bad happening, I quickly went into her room, picked her up and rocked her to sleep. I felt like a failure. What should I do in this situation? Thanks! Linda, I'm sure Valerie will give you great advice when she replies to your comment, but until then I'd suggest reading this post if you haven't already: http://babywisemom.blogspot.com/2007/12/starting-babywise-late.htmlGood luck! You're doing the right thing to use BW, but it will take your baby some time to get used to it. We just began CIO with our 10-week old daughter, so we're starting with her naps. For two days in a row, she woke up at 8:30AM, I fed her, changed her, and put her back in bed. I did not play or entertain her for fear of over-stimulating her, also she was yawning which I thought was a sign for her morning nap. She stayed awake quietly or an hour, then began moaning, crying, which turned into hysterical crying – lasting a total of 2 hours. By then, it's time to feed her again. So I picked her up, fed her, then she fell asleep.My questions. 1) Was she under-stimulated if she couldn't fall asleep for 3 hours? Should I have played with her to tire her out a bit? There was another post about older babies needing more stimulation. What are the signs for when they're not tired enough to go to sleep? 2) When she cried so much that it became even harder for her to fall asleep because of irregular breathing, should I sooth her to sleep instead? During the 2-hr crying period, she had moments of dozing off, but then would startle awake due to her fastened breathing. 3) If CIO lasted until feeding time, should she be fed or continue with CIO until she fell asleep? Cindy, be careful you don't mistake too late cues for sleep cues. Kaitlyn never really was good at showing sleep cues. 1.5 hours at that age is definitely too long; McKenna is just barely reaching 1.5 hour waketime at 7 months. See the blog label "optimal waketime length" for more on this.Jenna is also very right with being sure to not overstimulate. Keep it short and keep it calm. Having a newborn around all of the activitiy in the house is probably too much. He will need time in a room by himself. As he gets older, he will be able to handle more (and will need more). Linda, 1-it is possible. But she should only be sleeping 1.5-2 hours total. It is very likely that since she is just learning to sleep on her own, she will fall asleep, then wake after 30-45 minutes. There is a post called "waking early from naps/won't fall asleep for naps." I suggest you read that.2-I would soothe her.3-feed her at feeding time, but I wouldn't let it go on that long. The post I mentioned above should answer these questions. Any advice how to get a 2 yr old and 8 month old to share a room if the baby is not STTN? I tried searching sharing a room and couldn't find anything. My husband and I heard about BW and were very encouraged at the positive results most people have. Our daughter is 4 weeks old. The hardest thing for us to accept is the CIO. I'm a very type A person and the crying only increases my stress level. Plus, we are questioning some possible feeding/reflux issues. We have an appt with our pediatrician this coming week. When we tried a CIO session for a nap today we found when checking on her that she had a much larger spit up than her normal small spit ups. Is it normal for babies to cause themselves to spit up because of crying? When we laid her down she was dry and well burped with no signs of gas or upset stomach. If the crying makes her gas/spit ups worse I'm not sure it is for us. Plus her CIO time lasts over an hour with only small breaks if we go soothe her briefly or give her a pacifier, and she is so exhausted. Is it possible that with the spit ups we cannot do every part of BW? I have her on a 3-4 hour feeding schedule (she's been formula fed since 2.5 weeks) and have from the beginning of bottle feeding. Sara, my kids all have their own rooms, so I don't have experience with that. But from what I have heard from other moms, sharing at night is pretty much not an issue. They usually recommend white noise of some sort at night to help drown out each other noises. You will want to put the baby to bed first and then put the 2 year old to bed once the baby is asleep. Moms say their kids get used to each other's noises and sleep through even crying :)You can join the yahoo group (linked at the top of this page) for more info from moms who do share rooms. newmommy09, you can definitely do BW even if you don't CIO or if baby has reflux. My second had reflux. See the blog label "reflux." See also the post "Sleep Training According to Babywise. "For now, you can do methods like the Baby Whisperer's 4 S's. You can also just rock her to sleep or whatever she needs until her reflux is no longer an issue. You can still have a routine and structure even if you don't CIO. Be sure to see the posts I recommended. Hi There – my 2nd child is 15 weeks old and we had naps all sorted and had passed through the CIO stage until he started teething at around 11 weeks. And since them we have had to rock him to sleep for every nap. Although at 13 weeks he slept through the night – so his teeth eased up for a few days. We have only since then had to do CIO at night once for 2 1/4 hours. Most nights if he wakes he usually can resettle himself. Now at 15 weeks he is getting even harder to rock to sleep – we tried CIO for the last nap for the last 2 days. He cried for 2 hours and we had to get him up after no sleep for his scheduled feed at 7.30pm. AS you can imagine it was hard keeping him awake for that feed. I am concerned now that since he is getting harder to rock to sleep that is going to harder to retrain using CIO. WE have been waiting until his teething has subsided a little but has just got worse again over the last 2 days. Should we retrain now as teething has been going on a month for this young man or should we wait until he is older and not teething to initiate the retraining – even though it is going to be harder. AS you can imagine this is frustrating when we worked through the CIO initially to get his naps sorted and we are no better off when we will have to do it again. His routine is also eratic – as his daytime naps are usually only 45 mins or he only does one long one and the rest 45 minutes – so we are unable to plan our day. Can you suggest what we should do in regard to CIO. Thanks so much. PS Love BW and it worked fabulously on my 3 yr old daughter. Hels,One thing to know is when you do CIO again, it should be easier than it was the first time. It will start rough, but it should improve faster.I think you have to make the call on if it is okay to CIO at this point. One hard thing with teeth is that they come in pretty consistently for at least a year once they start. So it could be a long time before the teething is over. Another thing is it seems once the first couple of teeth break through, they handle teething better.You are with him and you can better judge how much pain he is actually in and if it would be fair to expect some self-soothing learning to happen right now.Good luck! Hi There! I have been searching and searching through almost every post that has to do with STTN and I can't find an answer to my question so here goes… My daughter will be 12 weeks on Friday and still takes her middle of the night feeding. For several weeks she seemed to have a stuck clock between 3:30am and 4. I fed her because she would take a full feeding. Now she's waking around 2:30am and since I know she can make it till 4:00 without a problem I won't go in until 4:00. I don't hear her fussing so I dont' know if she cries through. When I do go feed her at 4:00 she'll sometimes take a full feeding though not always and she'll wake for the day between 7:30 and 8:00am but usually won't take a full feeding. Her schedule is 8am wake, 11:00am, 2:00pm, 5:00pm, 7:30pm, 10:00pm dreamfeed and then she wakes anywhere between 2:30 and 4. I'd really like to drop the MOTN feed but am not sure if I can if she'll sometimes take the full feed or cry for over an hour. I'm willing to commit if I can be assured that she's ready. Any suggestions? KMonti, have you read the post "early morning feedings before waketime"? That post would apply to your situation. I did CIO starting at 3 months, and was glad I did it then. I know there are also advantages for starting at birth, but here are the advantages I found for starting at 3 months:-Mom is not emotional from post-delivery hormones and severe sleep deprivation. By 3 months, my baby was sleeping long enough stretches at night for me to be functional, patient, and think clearly. I could handle the crying a lot better. I no longer needed to nap when he napped, so his crying didn't prevent me from getting sleep I needed.-You have had time to get to know your baby and his/her personality and habits. You know what is characteristic and not characteristic for your baby and have had time to decipher his cries. 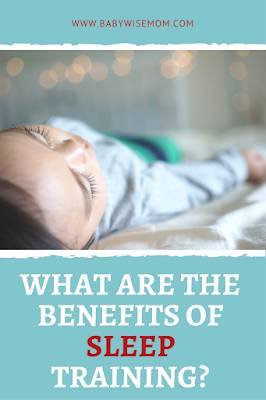 You know the difference now between tired cues and sleep cues.-You have had time to find your baby's optimal waketime.-You know what your baby is like when he is well rested and what he is like when he is not. I could tell he was tired after getting a shorter nap because he cried. I would not have known so well when he was younger. My baby was sleeping well before CIO, but was not going to sleep on his own.-The baby is still young and so the CIO process is easier than with an older baby.Also, my baby's sleep habits changed about 3 months, and the methods we had previously been using to get him to sleep started working less well anyway. He was more aware of his surroundings and was ready and needed to fall asleep by himself. I hope this helps someone else. CIO is a very personal thing. You know what kind of crying warrants your attention and what kind of crying just needs to sleep. As a mom, you know those cries better than anyone else! Summer, I haven't had that happen to me before (as you know). I can't really think off hand of anyone specifically it has happened to. As for what I would do, I can't really answer. There is so much to consider. If the child was hungry, I would feed the child in the night but try to get the food in the day.When you do drop these two feeds, I would do one at a time.I would say that most children that age do not need two feeds in the night. There might possibly be some exceptions for special medical reasons, but the average healthy 6 month old shouldn't be needing two extra feeds a night. So I would investigate this from every angle. Is the food just soothing some other problem? Is hunger the real reason she is waking? I know it is all hard to find out–but only you can decide that for sure.If you want, I can post this as a "help a reader out question" and we can see if any readers have had a similar experience. Let me know. POST 1 of 2Hi Everyone……well, since I reached out to this blog on many occasions when our 2nd child arrived over a year ago, I thought I'd take a few min and tell you about our experience with CIO and BW. To start, I should say we implemented BW with our first son and overall it went very well and it didn’t take too long. While we did let him cry in his crib when we put him down for naps/night or if he briefly woke up during the night, I’d hesitate to say we did CIO with him, rather, we just gave him a few min to settle which he normally did. Overall, he was an easy baby from the start.So, kiddo #2 comes around and we quickly learned that no two kids are the same. Our second son slept well while we were in the hospital, but once we got home, we learned that he had no interest in beginning a schedule or taking naps for that matter. Fortunately, he did sleep well at night and was sleeping through the night by 8 weeks. This was what kept us going. For the first month, we started working on a schedule. While 3 hour feedings were our goal, he was extremely fussy, pushing us to feeding every 2-2.5 hours. While we tried naps between feedings (in his crib) it didn’t work. Given that we were in month 1, we gave him some flexibility where he fell asleep, but once he did, we immediately put him in his crib. By month 2, we tried to be more strict, moving to 2.5 hours for feeding (unless he was really hungry) and putting him in his crib awake. This failed every time. We would let him cry for 10-15 min, but after that, picked him up and did the big no-no of helping him to sleep (pacifier, rocking, etc). This worked for a few weeks (i.e. we could get him to nap for 30-60 min) but then it started taking longer to get him down and he slept for shorter periods of time. Eventually, we got to the point of rocking him to sleep for almost 30-45 min for only a 5-10 minute nap. Out of desperation (for those parents who are going through this or have been there, you know what I mean) we resorted to driving him around the neighborhood. We knew that this was a horrible sleep prop to start, but he wouldn’t otherwise sleep. Any yes, he was miserable during the day because he wasn’t napping. So, a 15-minute car ride for which returned an hour long nap was worth it. But again, not a great solution. We worked with our pediatrician in hopes of finding something like reflux, gas, etc. We tried meds for all of these, but nothing seemed to alleviate his fussiness and/or unwillingness to take naps. PART 2 of 2We battled this until 4 months and our pediatrician (yes, a board certified pediatrician) recommended that we use CIO. I knew what this meant and how hard this was going to do. As I mentioned before, we mildly tried CIO without success, and this was hard to let him cry for only 10 min. However, this go around, the plan was to let him cry until he fell asleep OR his it was time to eat again. So, after a weekend of thinking about it, we said let’s start (before we began, we had to make sure both my spouse and I were equally ready for this). Monday morning day 1:At this time our feeding schedule was 7am/9:30AM/12pm/2:30pm/5:00pm/8:00pm. While we wanted to be a 3-hour schedule by now, he wasn’t ready. So, here is the log of activity.Mon8:30am –Down for Nap. Not a peep and slept for 1 hour (Yes, we couldn’t believe it. But, this prove to be a pure fluke).10:30 – Down for Nap. Cried until 12pm (yes, the whole time. We peeked on him and he was always ok). 1:30 – Put down for Nap. Cried for 45 min and fell asleep for 45 min. We let him sleep past his 2:30 feeding until 3:00.4:15 –Got tired, put down for nap 15 min early. Cried for 40 min and feel asleep for 45 min. 6:45 – Down for nap. Cried until 8pm (no sleeping)8:30 – Down for night. Slept till 7am (this wasn’t new)Tuesday8:30 – Down for Nap. Slept for 1 hour.10:30 – 8:30: Basically the same results as above, though cried maybe a few min less each time. Again, no sleep between 10:30-12 and 6:45 – 8pm.Wednesday8:30 – Down for nap. Cried 30 min. Slept 45 min10:30 – Down for nap. Cried 25 min. Slept 1 hour 5 min.1:30 – Down for nap. Cried 20 min. Slept 1 hour4:00 – Down for nap. Cried 30 min. Slept 45 min6:00 – Down for nap. Cried 30 min. Slept 10 min.Thursday – FridayIdentical results from WednesdaySaturday8:30 – Down for nap. Cried 10 min. Slept 1 hour11:00 Down for nap. No crying. Slept 1 hour1:30 – Down for nap. Cried until 3pm (no napping)4:00 – Down for nap. Cured 20 min. Slept 1 hour.6: 30 – Went out for dinner, so he slept in car seat.SundayProgress. Starting Sunday. He only cried 10-15 min for naps and usually slept 45 –60 min with the exception of the 6:30 nap. This never resulted in a naptime.1 month later and forward.0-5 min of crying for naps. 45-90 min of sleep. As feeding times began to stretch out, we started reducing the number of naps. Today, we have a great sleeper. I truly believe without CIO, this wouldn’t have fixed itself. I know how hard it is to do, and I can appreciate the controversy surrounding it. But, bottom line, babies need to take good naps (not small 5 minute naps). Once they start sleeping well, they are happier and sleep even better.As hard as it was to do, it worked and as long as it felt, it was only a few days. So, I do understand the controversy of letting a baby cry, but, looking at it more objectively, I ask this, what’s worse, 3-4 days a lot of crying and the start of naps, or several months (if not more than a year) of crying and no real naps?I leave you with the following thought that our pediatrician told us. If your baby didn’t like his car seat and cried, would you not use a car seat or would you put him in it and let him cry?Good luck to all. Cheers. Thanks for sharing your story Mark! Great thoughts. Part 1: What a great blog, especially for a first-time mom. Thanks! I'm sorry if this is a little long-winded, but I want to give you some context for my questions. My daughter is 8 weeks old, and I am blessed to still be home with her for another couple of months before going back to work because it will give me time to un-do some of the bad habits we've established. Our routine, unfortunately, has been a little unpredictable due to the holidays. Maggie is the first grandchild and very popular. Nevertheless, in establishing a "routine," I followed the advice of the lactation specialist in the hospital for the first 3 weeks (demand feeding). This was especially difficult because I had a spinal headache from the Epidural. Even though we never let the baby cry, there were still a lot of tears…from me! Then a friend suggested I read _Healthy Sleep Habits, Happy Child_. I liked a lot of what Weissbluth says. I immediately started more of a schedule with Maggie. I still didn't let her cry, but I wouldn't immediately offer my breast either. This was working for a while (by working, I mean I stopped feeling like a human bottle and Maggie seemed to be getting more satisfying feedings), but I was also doing anything and everything to help her sleep within 2 hours of wake time like Weissbluth suggests. She loves her swing and I can almost guarantee that she will sleep anytime I put her in it. The problem is that I know motionless sleep is best. She wakes frequently in the swing, but the rocking motion eases her back to sleep–a habit that I know I need to break. Plus, I am also concerned that she isn't getting good, uninterrupted naps in the swing. Lat weekend, A few friends recommended BW when we were at a New Years Day party. I started reading the book a few days ago, and at first I was skeptical. Mainly because I have been struggling with breastfeeding, and I felt like the tone was very critical toward someone like me. But then I found your blog and I have spent the last couple days reading as many posts as I could find about BW (the theory behind it and how to apply it). I also finished reading the book. Now I think that maybe I am just hypersensitive about my breastfeeding situation (I had reconstructive surgery years ago and I think it has affected my ability to produce enough milk. Maggie is healthy and gaining weight, but she is often unsatisfied even after an hour of breast feeding. I started supplementing with formula and that seems to be working. I have resolved to keep breastfeeding as long as I can, even if it means she is getting half breast milk and half formula. Anyway, I digress). I have decided to implement BW because I want Maggie to learn how to sleep in her bed…I mean she will eventually outgrow her swing. Anyway, I started yesterday and I have a couple questions that I haven't been able to answer by reading the book or the blog. I'm sorry if you have already answered these questions elsewhere. S. Davis,1) See this post: Early Morning Feedings Before Waketime: http://babywisemom.blogspot.com/2008/01/early-morning-feedings-before-waketime.htmlIf she isn't hungry, then at first I would work on getting her back to sleep. As she gets better at soothing herself, she will be able to do this on her own. You might try a humidifier or some sort of white noise with her in her room so she can't hear your husband getting up.2) Yes, she should still be on a 3 hour schedule. If she fall asleep 15 minutes before, I would give her an extra 30 minutes to sleep, but not more. It is a hard thing at first, but she will get in the grove and be a better sleeper. I promise it will work out. My oldest was 9 weeks when we started and he has been fine. He is a great kid who is very smart. He sleeps well. It can be done. I know from your perspective your baby is very old, but you have a whole lot of time ahead of you. It will all work out :)Be sure to read the "index by age" tab at the top and read through the "0-3 month" age group index posts. And also the starting late posts. Update and thanks:I just wanted you to know that once I started following the BW principles, my issues seemed to resolve themselves….well, kind of. I let Maggie cry one morning, just to see what would happen (I set a 15 minute max), and after about 10 minutes, she went back to sleep. Ever since, she has slept consistently until 7:30 – 7:45 every morning. She also stopped crying for naps after just a couple days. I think I was panicking that first day. But I kept reading your blog, which gave me resolve to stick with it, and things got better sooner than later:) Mags is now 3 months old and STTN consistently. She started on her own the night before I had to go back to work…so great! She takes decent naps and is a genuinely happy baby. Everyone keeps telling me how lucky I am to have such a good baby. I know better, though. Thank you for providing such a great resource. I'm a subscriber now, and I enjoy reading about new ideas and tips every morning while drinking my coffee. Thanks again! Thanks S. Davis! I love to hear the success stories and love to hear the thanks! You are very welcome! I am a foster mother, so I have a unique challenge to care for babies who have never been on a routine without much knowledge of their past experience. We just received our second foster baby, and she is almost 10 weeks old. She has been a great sleeper. I stumbled on your posts regarding the Four S's and Establishing Consistency. Within 2 days, she was right on schedule and doing great!Fast forward a week or so, and this past weekend we got off schedule a good bit. She had several court appointments and parent visits that disrupted nap time. We had friends over, which affected our schedule. Since then, she's been much fussier at nap time and bed time (which I know is to be expected). Our routine used to be that we would swaddle her tight, sit for a few minutes, lay her down slightly awake, and she would fall asleep on her own. If not, we would shush and pat.Recently, this has changed to swaddling her really tight, sitting still, and she eventually just starts fighting hard. Initially, I would just hold her tighter, grit my teeth, and bare it, but it never worked. Now, I bounce her or rock her to soothe her. Then, I sit still for a few minutes, but often after I put her down in her crib, she spits out her pacifier and starts to cry, and the shush pat doesn't seem to work.Earlier today, I just left the room and let her cry for about 15 minutes before going back in, replacing her pacifier, and she fell right to sleep.I have read your posts about pacifiers, and I don't want it to become a sleep prop for her if that's going to be detrimental, but should I really let her scream for who knows how long rather than just giving her her pacifier and letting her soothe right to sleep for hours?I am certainly willing to do CIO. I just want to make sure it's worth it if simply going in and replacing her pacifier will help her to sleep soundly.Being a new mom, your posts have been invaluable to me. Thank you!~Eden H.
Hi Eden, This is a really hard call since you don't really know her backgroudn at all–but I will say that 10 weeks is still young enough that you can have a huge impact on her.I would suggest you start with you reinserting the pacifier and see how that goes for a few days. If that doesn't seem to be helping her move toward sleeping well on her own, reevaluate. Go with your "gut" and take it slow. Best of luck to you! I think you are wonderful for doing that for those babies. thank you so much for this blog!!! i just finished reading BabyWise and tried to impliment it and its been such a disaster. Im a new parent with an 8 week old boy. we've had trouble breastfeeding from the beginning, not having enough milk, wrong positions, falling asleep, found out he's tongue-tied but don't want to cut it because he's putting on weight fine and apparently seems to be feeding fine, but sometimes he gets so excited and keeps pulling himself off and then on, off, on, off on, without really drinking but with no crying, or he'll just sit there looking just sucking. ive tried getting a full meal out of him but sometimes it takes up to an hour and is so draining. he also has lots of gas and doesn't have bowel movements reguarely -have had him checked out alot for that and all say its normal. we've been ginving him coconut oil daily and that helps, he poops ever 5-7 days. his gas often makes him wiggle when feeding and he pulls himself off. its very frustrarting, and then sometimes after 'breastfeeding' for 30mins-1hr he'll be 'hungry' again in around an hour.the rountine ive been having him on just winging it, i hadn't read any other books until babywise yesterday, is:wake up from sleeping say 10amdiaper changefeed: between 15-45 mins say 10-10:30wake time: 1 and a half hours say 10:30-12(he's happy and awake until 40 mins until next feed and then is just miserable, i do everything to stop him crying, often he'll bob saying he's hungry but then at the same time i feel he's tired but every time i put him down to sleep, he wakes within 30 mins wanting to feed. so thats why i try to keep him awake till the next feed) but then realized i was feeding him every 1 and a half hours because i was counting from the BEGINNING of the feed.since reading the book ive been trying to stretch him to 2 hours and focusing on getting a fuller feed, but its very difficult. then after the next feed i put him down to sleep for 2 hours, but lately he wakes after 1. so the schedule looks like:wake, diaper, feed, wake time, diaper, cry/wake time, diaper, feed, sleep, repeat.he's been sleeping 5-6 hours then feeding then 3-4 hours then feeding then every 2 during the night and then going into the day.but since reading the book i see its meant to be feed/wake/nap.we tried doing that routine but its just not working, we've been trying the last two days and every time we put him down to sleep he cries for 45 mins to over an hour until we just pick him up and feed him again and give up. im just so confused. and am hating the crying, he just doesnt understand and i feel like such a terrible mum… whenever we put him to sleep, we pat or rock him till he's almost a sleep and then put him down. but since doing this we just put him down and he just cries and doesn't stop. he's never slept unless i feed him and then he sleeps right afterwards for 1-2 hours and then try again with the feed/wake/nap thing. but its just not working..how long are they meant to cry?? ?how long is waketime meant to be and then when are you meant to put them to sleep? ?again, thank you so much for this site! ive been feeling like ive been doing it all wrong from the beginning..
JacquiMiranda,For gas, I suggest gas drops. I have a ton of info on crying. Go to the blog index and look under Cry It Out (CIO). Good luck! This whole thing borders on sadistic. I feel so bad for all your babies. They are born to be held and loved. Reading these comments makes me sick to my stomach. Trust WILL be lost…did you know neglected and abused children STILL choose their parents? When your children are grown I am sure they will feel hurt about how you cared for them in infancy. Would you like to cry yourself to sleep? Well, I hope if I needed help winding down that someone would stay with me while I cried. Unknown, I don't know why I am bothering to respond to you since you aren't even brave enough to comment as yourself…HOWEVERMy mother-in-law did CIO with all four of her children. They are all smart, and are all quite successful. They also all love their parents and trust them fully. So I am sorry to have to inform you that you statement that trust WILL be lost is not correct. I am sure if my husband felt bad in the least about his mother doing CIO with him then he would not have encouraged me to do it with our children. And same with his sisters. NEED HELP! (So grateful for your blog btw! I even refer other moms to it! )I have a 6 month old who has done overall pretty well with sleep considering she has to share a room with her older sister. She slept through the night at 6 weeks (just like my almost 4 year old, whom I also did babywise and was incredibly blessed!). The problem is, it has been about a 70/30 thing where the baby will sleep very well and then wake at night at which time, we move her sister to the living rm so she can cio. Lately however, this has been the case every night. She wakes to cry and we move my other daughter to the couch. Last night was horrible-she wouldn't stop crying after 1130—she cried what seemed like all night! My husband and I would take turns checking on her and she seemed fine until we would leave the room. I eventually fed her and she slept 3 hrs only to awake again 2 hrs before her waketime. She is on a 4 hr schedule with 3 solid feedings during her feeding time. I thought the problem may be hunger and teething (gave her advil for the teething), so I fed her yet again in my bed and she finally fell asleep next to me—a big no no for us! It has been really difficult lately and I am at a loss for what to do. She as well seems to be stubborn and just wants to be with mommy and she's fine. Any thoughts would be a huge blessing for me! Thanks! Clarification–she nurses 4 times a day and has 3 solid feedings during 3 of her nursing periods. hi mjbyouth, I would say it is likely a growth spurt going on since she slept soundly for 3 hours after eating. You can either increase the feedings in the day or feed more at each feeding. Best of luck! I started cio for bedtime and now its down to 5 or 2 mins of fussing not crying sometimes.. But naps are a horrible!!!!! help. on a good day i can tell when he is ready for a nap because of his cues but if he wakes up to ealy or too late i miss it. i put him down to early or too late. I dont know why i cant get it. Any suggestions. Also, is there a way he will stop all together crying everytime i put him in his crib is he 8 months. You should know i started naps and bedtime cio together. I just didn't want to put him through all of this again. Katerine,He might be not napping well just because he is just getting used to napping while falling asleep on his own.Most babies his age can be up for two hours before needing a nap, but that is considering they take two hour nap. So if he is not napping two hours, he might need to go down sooner than two hours long. See my post on optimal waketime length for help there. You will get it! It takes time, and since he started this at 8 months, he has some re-learning to do, so he will probably take a bit longer to learn it all, but he will get there. Ok I posted a comment earlier on another post but I have to add to it since last night…My son is 10 wks old and was a perfect sleeper til 7 weeks. He was on a great 3 hour schedule, sleeping 1.5 hours for naps with only the occasional short nap. He was happy and playful during waketime too. He slept 5 and sometimes 6 hours at a time at night. Then he went through a growth spurt (I know this because I went to his 2 month appt at about 9 weeks and he had gained 2 inches in less than 3 weeks!). The growth spurt threw off his schedule and I can't get him to recover! He is long and lean (25in and 11.5lbs) which is OK, but it does make me always question whether he is getting enough to eat! He progressively started waking early for each nap, and I initially treated it as a hunger issue. I think for awhile it was, but he never transitioned back. This week I finally started CIO with him (again — we had tried at 7 weeks but quit when we realized he was growing). I started with his naps. I tried to put him to sleep after 1 hour of waketime (he doesnt have good cues at all!) and he played in his crib for a good 30 min then went to sleep fairly quickly with little crying. For his second nap I tried a 1.5 hr waketime, and he fell asleep really fast with no crying at all, but then woke up 35 min in, and cried off and on (interspersed with playing) for a hour and only fell asleep right at the end of his nap!I let him sleep for 30 min and then fed him. At night, he is also waking more. He had gotten to where he was only waking at 2am and 5am, and seemed hungry both times. I would feed him a shorter feeding at 5 so that then he would eat well when he woke up. But then he started waking 4 a nd sometimes 5 times at night and would not be comforted without feeding, though sometimes I had jsut fed him 2 hours ago or less! I read that you didnt do CIO at night til 12 weeks — but what if I'm sure he's not hungry? Last night I had my husband feed him with a bottle to see if he would take a full feeding. He ate at 8, then I DF at 1130 (was planing on earlier but I fell asleep! ), then he woke at 2 and we let him cry since I knew he had just eaten — he cried for about 45 min (not very intensely though) and then fell back asleep. He woke at 430 and my husband tried to feed him but he only ate about 1.5oz then went back to sleep til 8amSo here are my questions:1- I know BW says 1.5 hours is too long of a waketime for him, but if he is playing in his crib and then falling asleep at exactly that time, should I increase his waketime?2 – If I let him cry til the end of his nap and he DOESNT fall asleep should I just let him get up and feed him? Will that defeat the purpose of cry it OUT? And if he DOES fall asleep at the end of this nap should I have let him sleep or get him up since its time to eat?3- Should I start CIO at night? Can I be confident he's not hungry or not?I'm going back to work in less than 2 weeks and I really want to get things somewhat figured out before then!Thanks!! Katie, 1-I wouldn't go a longer waketime at that age. 2-I would actually at this point probably not CIO mid nap right now, but some moms probably would. If you decide to do CIO and he falls aslseep at the end of his nap, i would let him go thirty minutes then get him up.3- I wouldn't do CIO day and night at the same time. After some practice, you likely won't need to CIO at night because he will be better at self soothing. Thank you so much for this blog! I am having a hard time with my 2 week old baby girl. All of her naps are so different. Sometimes a morning feeding will be followed by waketime until the next feeding (not neccessarily crying, just awake, even though we put her down for a nap). Sometimes all of her morning/afternoon feedings, she will fall asleep while finishing her bottle (she is formula fed).However evenings are becoming predictable, and not in a good way. First, let me paint a picture of what we have for her sleeping arrangements. We do have a crib, however right now, she is sleeping in our room, so she has a Pack N Play. We also have a mini Pack N Play in our family room. Sometimes we put her down in the family room for a nap, sometimes in our bedroom. My reasoning behind this, is that I strictly made our first DD sleep in her room, in her crib, and we tiptoed around her naps. She is now almost 4, and CANNOT sleep through ANYTHING. We still have to tiptoe around her one nap during the day, because she will wake up even if we flush the toilet! So, I really want my 2 week old to be able to sleep through sounds and such (maybe this is a mistake on my part? ).Anyway, back to her evenings. She is on a 7am, 10am, 1pm, 4pm, 7pm and 10pm DF. She then normally still wakes us up every 3-3.5 hours at night to eat. Our problem is, is after her 7pm feeding, we put her down in our room for bedtime, and she SCREAMS. This can and has lasted until the next feeding. However if we put her in the mini pack n play in our living room, she will fall right to sleep (she is currently sleeping peacefully there now, after we put her down in our room at 730pm, and she screamed until 915pm…I finally brought her out here, and she is content). My question here is, can a baby be more comfortable in a smaller space? Would a different pack n play be considered a sleep prop, because it isn't her "bed"? And am I going to have difficulties getting her to sleep in her REAL crib, if she doesn't like the open space of a standard size pack n play?At her 10pm feeding, she will take down her bottle (she eats 2.5-3oz per feeding. I thought maybe she was going through the 2 week growth spurt, so I upped her formula to 4oz, but she still only ate 3oz), I will change her, then put her back down. Sometimes she is half asleep, and stays asleep when I put her down, only to wake up around 1215am, 45 minutes before her next feeding time, and SCREAM. Last night I let her CIO, and she cried until 1230, fell back to sleep and woke up at 110am to eat. The rest of the night, she is great. She will eat, burp then fall back to sleep.I don't know what I'm doing wrong. It seems as though when I put her down while she is completely awake, she will scream until next feeding. I don't use the word scream lightly either. She gets her self so worked up, kicking her legs and pumping her arms (she HATED to be swaddled). My first daughter did not have this rough of a time with CIO or naps. I'm ready to pull my hair out.I'm sorry I've rambled on, but I'm at my wits end. I have even consulted my sister in law, who also followed BW with her two boys, and she said she couldn't help me because her boys never refused to sleep when CIO. Is there such thing as a baby that can't self soothe at this age? CountryMama, I would defiinitely not have her in your family room for naps. Even if she didn't wake up, you can disrupt sleep rythyms so that certain critical sleep patterns don't happen. You can have her in a room and still have her used to houses noises.Yes, to a baby being more comfortable in a smaller space–especially in those first three months. After that, they often like to stretch out more, but those first three months are very snug months.I wouldn't worry about a bed becoming a sleep prop. I did alternate my babies in beds to keep them used to sleeping in various places. Be sure to swaddle. For the deamfeed, I would change her diaper before you feed her to prevent her from waking. She is definitely young. See my post on "Newborn Sleep Heirarchy" for further ideas here. Good luck! I've been trying CIO with my almost 4 week old. So far we haven't been successful. I let him go for about an hour at each nap and he has yet to fall asleep, minus one time where he slept for about 10 minutes. I've tried going in at intervals to comfort and just leaving him alone. Neither work. If I let him go an hour or just wait unti his next feeding aren't I always "rescuing" him at some point? I also can't get him to fall asleep when I get him up. I've tried the swing, rocking, bouncing… The only times he's fallen asleep is if I go for a walk outside with him in the Bjorn or sometimes in the car when running errands. I have 2 other children so that's not always an option.I swaddle him, put him in a quiet room, and turn a fan on for white noise. I've tried very short wake times of 30 minutes to longer of about 50-60 minutes. I'm not sure if I'm doing this right? I've read all the CIO posts a I feel like I'm missing something. Even if he's too young for CIO how do I get him to sleep?Thank you!!! I meant to add that I've been feeding him every 2 – 2.5 hours during the day so even if he's going through a growth spurt I don't think I could feed him more often than that and he doesn't sleep while nursing (I almost wish he did for the desperate moments when I would be willing to nurse him to sleep…)Any tips on how to make CIO for naps work would be so helpful! Came across your blog on a search. I would so love to let my six week old cry it out but she will cry for about twenty minutes and then vomit….any suggestions? Thank you in advance for your time and your awesome blog. I would look into other ways of teaching to self soothe. Have you looked at my post on the 4 S's? That is helpful. Also, it might be that you are keeping her up too long. If the baby is up for the correct amount of time, they usually won't cry very much. Hi! I so appreciate your blog. My husband and I followed baby wise with our first born and LOVE it and the results. She is 2 years and 2months and is an incredibly happy kid. She is a great sleeper, I know these two are connected! We have a 17day old daughter and determined to start implementing CIO sooner than I did with my 1st daughter (she was around 8 weeks old when we started).Day #1(yesterday) was pretty easy. Today, was definitely not. She went down easy. Was quiet for 10 minutes and then cried off and on for an hour and 10minutes. I finally moved her to the swing, so we weren't too overtired for the next cycle. The next round she was so tired, she are a full feeding, but, basically fell asleep right after and took a great nap. And right after our last feeding, again, cried off and on for an hour. My husband went in, loved on her, put her down and she cried all the more. I know the benefits of CIO, I lived it once. But, I feel like when she is this young, I'm creating an overtired kid who isn't gonna be able to recover enough to get decent sleep in. With my first daughter, I let her CIO until her next feeding If need be, and she was fine. I'm just worried two weeks is too young to do this. Also, I'm still learning her optimal wake time. It seems to be around 35-40min. But, I'm unsure. I know consistency is so key. Do you have any advice? Thanks! Kmoore1–always go with your gut. If you feel like it won't work for her now, wait and do it when you feel more comfortable with it. I would suggest you look into the 4 S's I talk about on this blog. Good luck!